Hope has become such a "wimpy" term in modern vocabulary. It hardly qualifies as an adequate translation of the meaning in most New Testament passages. Hope is the assurance that what we believe will happen. We could call it spiritual confidence. 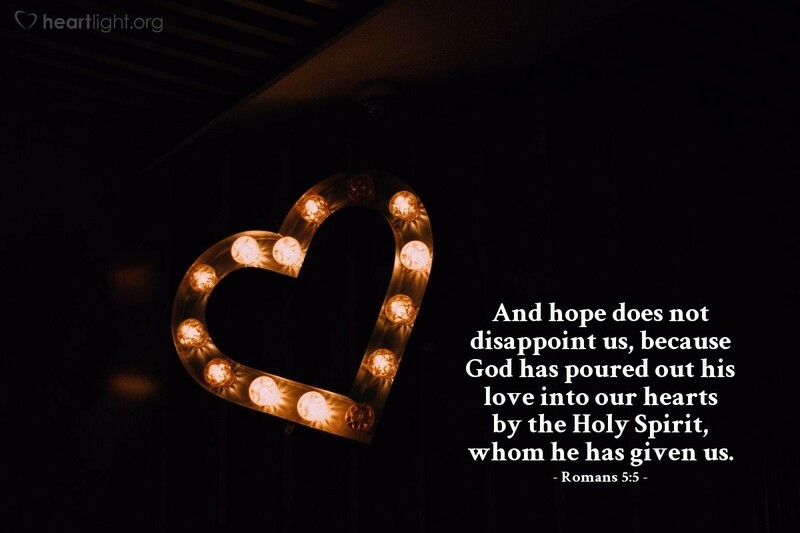 We have that spiritual confidence because more than just a wish, more than just an emotion, more than just a belief rests in our heart; God himself lives in us through his Holy Spirit. When we become Christians, Jesus pours out the Spirit upon us (Titus 3:3-7) as God's gift to us (Acts 2:38; Acts 5:32) to cleanse us (1 Corinthians 6:11), make us part of the same Body (1 Corinthians 12:12-13), and live inside us (1 Cor. 6:19-20). Paul adds one more thing to that list of blessings from God's presence within us — God's love. We don't just have it; God keeps refreshing it through the Holy Spirit, just as Jesus had promised (John 7:37-39).